When I was a kid, I got to choose what kind of birthday cake I wanted every year. And every year I requested an ice cream cake. Each bite was filled with a cold, crunchy, delicous explosion. 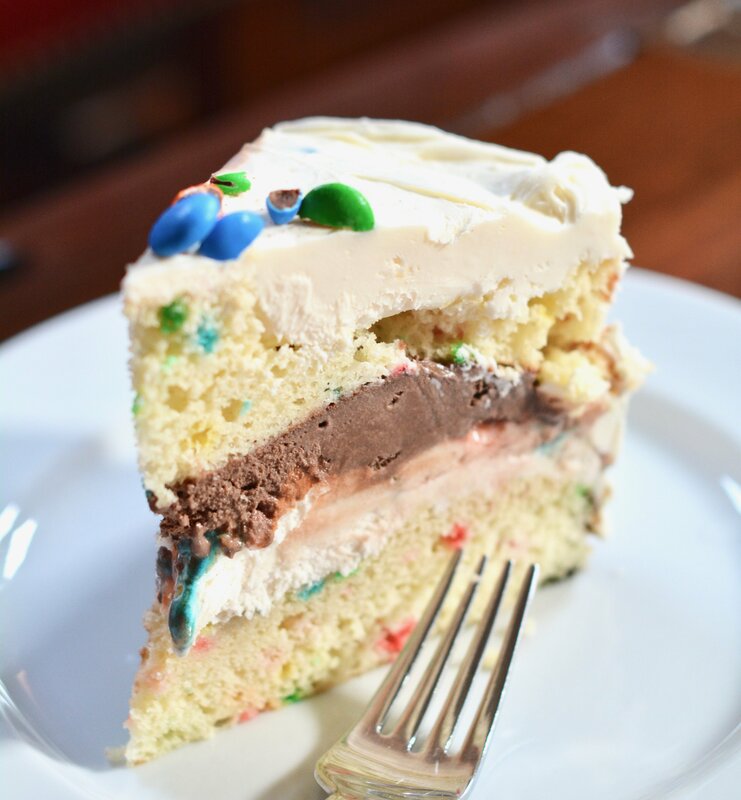 I still love ice cream cake, so I came up with this funfetti cake with ice cream layers, a layer of crunchy candy and a thick layer of frosting. Although it’s not the most beautiful ice cream cake, we think it’s as close to a perfect dessert as you can get. Yes, it’s still a perfect treat for birthdays but it’s also ideal for eating dessert on the porch with friends and family on any given night. 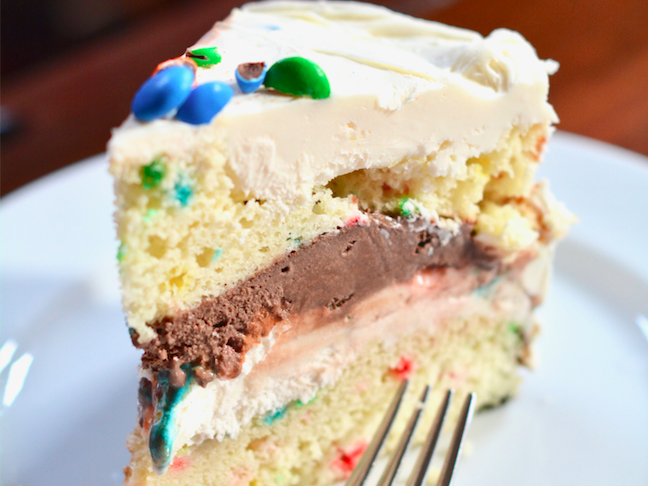 Want to make your own funfetti ice cream layer cake? Follow my recipe below! 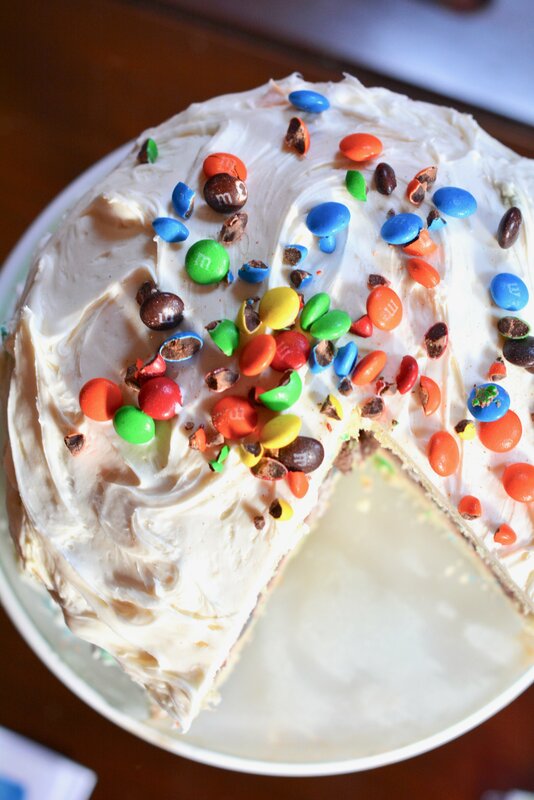 With funfetti cake, two flavors of ice cream, M&Ms, and vanilla icing this cake is totally irresistible! Step 1: Prepare mix and bake the cake in 2 8-inch rounds according to box instructions. Allow to cool completely. Step 2: Place the first round ( this will be the bottom layer) in a 10-inch springform pan. Carefully spread the vanilla frosting in an even layer on the cake. Then scatter the M&Ms on top. Step 3: Repeat with the chocolate ice cream for second layer (top layer). Step 4: Place the chocolate layer on top of the vanilla layer. Wrap the cake in plastic wrap and freeze it for 4 hours, or overnight. Step 5: Remove the cake from the freezer and, working quickly, frost it completely on the bottom and sides and scatter the remaining crushed candy on top. Return the cake to the freezer to chill for 2 more hours. Then, slice and serve!